Though the primary season goes on for months, no single day will see as many contests as March 1, so-called Super Tuesday. More so than any other day, Super Tuesday gives candidates a chance to make a broad case about their nationwide appeal. Up to this point, contests have been taking place one at a time. Voting will take place in 12 states and the US territory of American Samoa, though not every state is choosing nominees for both parties. Only Alabama, Arkansas, Georgia, Massachusetts, Minnesota, Oklahoma, Tennessee, Texas, Vermont and Virginia will hold elections for both Democrats and Republicans. Alaska will have only a Republican caucus while American Samoa will have only a Democratic one. Unlike the Democratic caucus in Colorado, which will pick a nominee, the Republican caucuses in Colorado and Wyoming will not. How many delegates are at stake? About one quarter of delegates are up for grabs for Republicans and slightly fewer for Democrats. 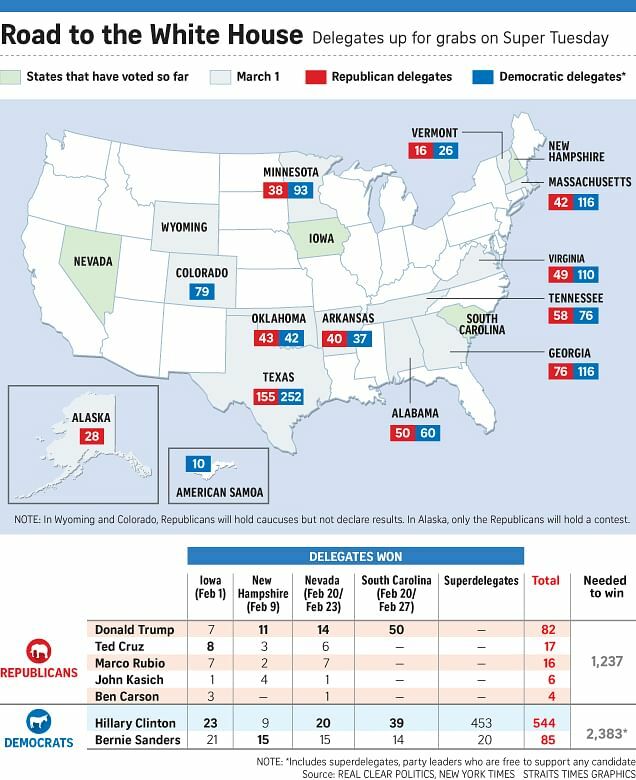 Republicans will allocate 661 delegates while Democrats will allocate 865. To win the nomination, Democratic candidates need at least 2,383 delegates while Republicans need at least 1,237. Which are the races to watch out for? Texas is the biggest prize for Republican candidates. It is the largest state voting on that day and has 155 delegates at stake. It is also Senator Ted Cruz's home state and a loss for him there could spell trouble for his campaign. On the Democratic side, the broader result will be an indicator of whether Senator Bernie Sanders can make an improbable comeback.